Announcement Enjoy the current Back to School Sale! I am headed to Texas Sept. 2, so all orders placed after Sept. 2 will not ship until after Sept 14. I apologize for the inconvenience. But, at 20% off it would be a good time to get your orders for Christmas bows in! Discount automatically applies at checkout for orders over $25. Aurora Bows specializes in bows for dogs, grooming bows, small puppy bows, collar bows, and pet bows with a focus on quality, variety, and whimsy. I also sell fiber art, hand decorated creations, and digital download coloring pages.. 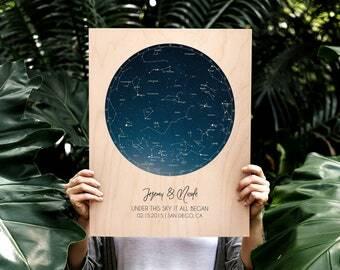 MOST ORDER SHIP WITHIN 24 HOURS! Please read Aurora Bows’ policies for more information about shipping. Aurora Bows has been happily serving the dog grooming and pet dog fancy for 10 years on Etsy. 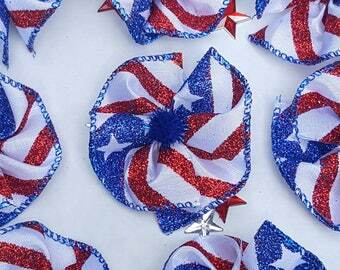 Our bows are handmade from quality ribbon that have been heat sealed to prevent fraying and decorated with a bit of “bling” to add whimsy. We use the most popular size, quality latex band so your bow will secure easily into hair or onto a collar. Always environmentally conscious and thrifty, we use ribbon that is end lot, remnants, or overstock. 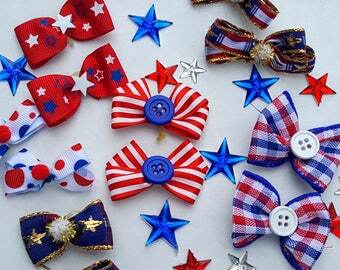 Doll-makers and other crafters have found many other ways to use my bows. 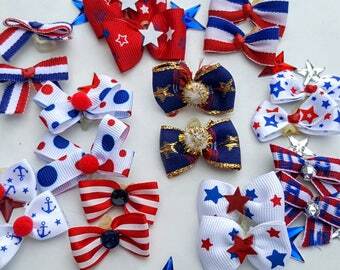 Quality, variety, emphasis on customer service, and pre-made ready to ship bows sets Aurora Bows apart. We do not broker bows ever! All bows are completely handmade and shipped by little ol’ me. Please send me a conversation or email Bling [!at] AuroraBows.com if you have questions, concerns, or a custom request. I do my best to get your bows shipped out to you as quickly as possible (usually 24 hours) . 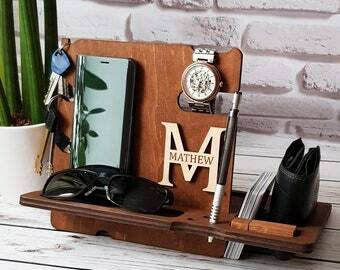 However, all of my products are handmade and it takes me time to work through each order. During busy times like Christmas, it may take the full 5 days. I do offer rush processing. 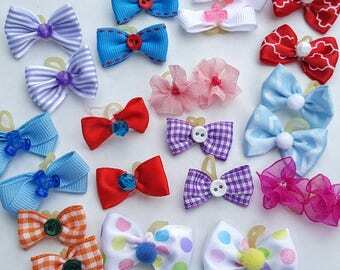 Please contact me if you are in a hurry to receive your bows. Enjoy the current Back to School Sale! I am headed to Texas Sept. 2, so all orders placed after Sept. 2 will not ship until after Sept 14. I apologize for the inconvenience. But, at 20% off it would be a good time to get your orders for Christmas bows in! Discount automatically applies at checkout for orders over $25. 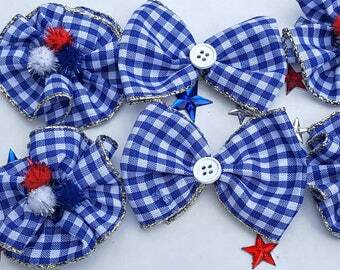 Collar Bows, Large Dog Bows - Independence Day, 4th of July, Red White & Blue, Military, USA - 8 bows 2"
Bows are beautiful! Arrived quickly and well packaged. Seller was quick to respond to my questions. Gracie has received many compliments on her bow! Will be ordering again! I love the fabric and detail of these bows. They are the perfect size for my yorkie, and I love the variety of colors and embellishments! Love it, love it! Everyone who sees it comments on it. Would buy a companion piece or two if offered. Because we all need more pictures of cute puppies in Aurora Bows! 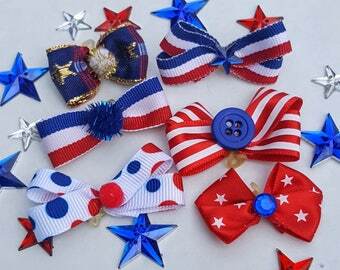 A fun assortment of dog grooming bows from Aurora Bows. My tangled Jack-o-Lanterns were featured in the Fall 2016 issue of DO Magazine! Thank you Panda Publishing! Gidget - Aurora Bows make her tail wag! Tobi my Shetland Sheepdog - Beboni's Come What May from Shirley & Renee Boniface in Alaska. He's smart, pretty, & funny. Aurora Bows was born while I was working at a groom shop several years ago. I saw how much the clients enjoyed the bows and bandannas we put on their dogs when they were ready to go home. The groomers enjoyed pawing through the basket of bows looking for just the right bow for each dog. The shop owner asked me to make some bows for the shop because she was unhappy with the quality and variety of the commercial bows. 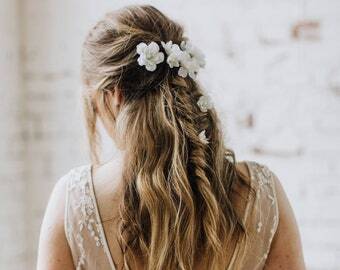 She didn't want to send her dogs home with a swirl of chintzy acetate tangled in their ear hair. Most of my customers notice that my bows are a little different. I think the difference is in the process. I don't make bows if I'm not feeling happy and positive. I make every bow myself. When I put together an assortment and ship it, I take the time to think of the dogs and groomers that will be receiving the bows and I infuse each bow with a smile. I also try to make my bowmaking time special for me. I listen to my favorite tunes and enjoy the process. The ribbon I use is end pieces and surplus from boutique bow makers I have met online. Most of the designs are gleaned from their forums and lists. Adding bling (an embellishment) to a standard groomer bow was at the request of the local groomers. At one point, I wanted to stop adding bling and just have the "economy bow." My customers pleaded with me to keep the bling. I do NOT use cheap satin acetate. I like to think I'm doing my bit for the environment. 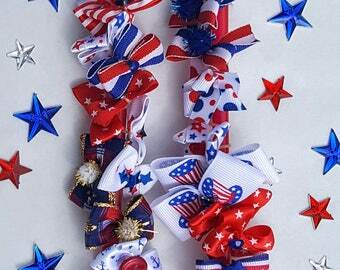 My ribbon, bling, and bows are all made in a smoke-free, chemical free environment. Everything is stored in a clean, new plastic container and shipped in clean, new shipping materials. When possible, I recycled the outside shipping box. Over the past 50 years I've made and sold everything from toys and dolls to handwoven fiber art and web design. My great-grandmother fed her children by making flowers from crepe paper dipped in wax which she sold door to door. My father was a lapidarist and silversmith. I guess hand crafting runs in my blood. I am the homeschooling mother of two girls . We live in Wasilla, Alaska. When I'm not keeping up with the girls or making your bows, I enjoy grooming, showing, and spending time with my six dogs - 2 Australian Cattle Dogs and 2 Shetland Sheepdogs and an English Shepherd. I also enjoy hearing from people all over the world and shopping on Etsy. I'm captain of the Alaskan team on Rtsy. Surfer of life's tides. Always trying out new creative endeavors. Love having an Etsy shop so I can spend as much time as possible on the shore and with my children and dogs. I love to travel and practice Qigong. My apprentice bow maker and youngest daughter, Maybelle Rose. Lover of wolves and music. She has the voice of an angel. Digital art is her main creative outlet when she's not sorting bows for me. Aurora Bow's Assistant manager and also my oldest daughter. Aurora Bows is a family affair. Jean's main activity is writing. She writes novels! She is also my chief dog wrangler and steps in for me when I need to be away from my business.